A Normandy Kitchen: Grilled black peppered chicken, salad with parmesan dressing and flat bread . 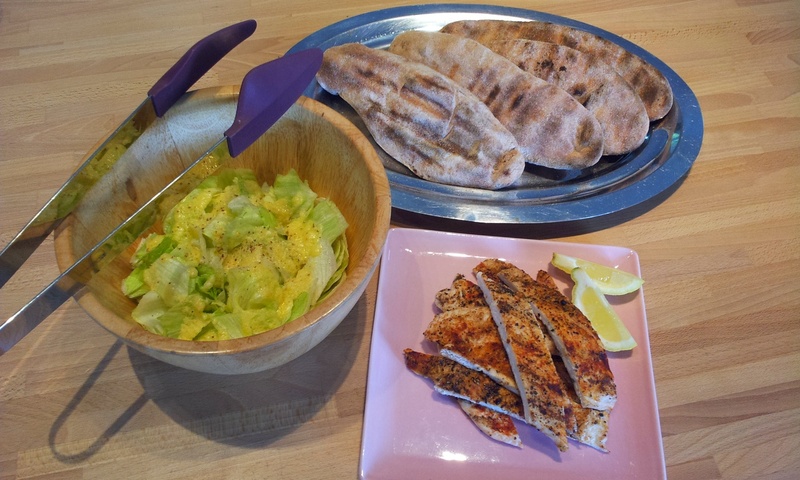 Grilled black peppered chicken, salad with parmesan dressing and flat bread . Make as pizza post, just to the point after the first rise. Then cut into 8 pieces about 90g each. Form into rounds with the seam underneath and then roll back and forth to about 20 cm long. Put bread (extra flour on them) onto barbecue at about 200°C/400°f a few minutes each side. The oven is also fine, but they will need longer. I like this simple dressing and it has to be on a firm leaf like iceberg salad or a frisée salad or endives, as it is heavy. Whisk the water into the mayonnaise and add the oil slowly and then the cheese. Just hammer out the chicken quite thinly, sprinkle with black pepper, celery salt and smoked paprika and grill for a few minutes on each side and let rest. Serve with lemon wedges to squeeze.